Simple, practical changes you can make starting today! 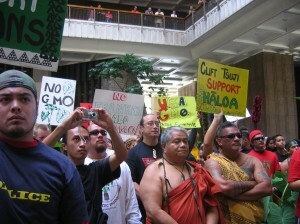 If you are a legislator or agricultural decision-maker, intro­duce or support legislation for 5-10 year moratoriums on open-air releases of GMO crops until long-term, peer reviewed animal, hu­man health, environmental and agricultural studies can be done to ensure Hawaii’s protection. We can help organize testimony from the outer islands. Contact Us. If you are a farmer, refuse to grow GMO crops. Educate other farmers about the problems of GMO farming. Test your papaya trees and chop down your unwanted GMO trees. Contact your extension agent to ask that they begin to provide tests. Let your exten­sion agent and legislators know the reasons why you don’t want GMO pollen and seed in your growing environment. Liability for contamination of your crops, loss of markets, high costs of testing, or loss of seed variety lines and ability to save clean seed are among the reasons. Contact Hawai’i SEED for strategies for your industry group to follow to prevent commercial release of a GMO version of your crop such as the coffee and taro industries have done. If you are a consumer, shop and eat GMO-free. Use the con­sumer choice guide in Facing Hawaii’s Future or check the true food network to help you choose GMO-free foods. When you buy papayas in the market in Hawai’i, dispose of seeds so they can’t grow into GMO trees. Demand labeling of GMO products from your market, manufacturers and governments, so that you can make an informed decision. If you are a citizen, speak out. Write letters to the editor – this is an easy and direct way that you as an individual can have a big impact on the public discourse that affects policy. Contact your legislators. to let them know that this technology has entered the food chain and the ecosystem without sufficient testing and without your permission. Ask for a moratorium until it has been adequately tested. Educate yourself and your neighbors about this topic, which is often left out of “mainstream” news. Give volunteer hours or financial support to Hawai’i SEED. Donate today! If you are a gardener, use GMO-free seeds. Ask your county officials if any GMO crops are being grown or tested in your area with crops (especially corn) that could contaminate your family’s garden corn crop. Test the papaya trees in your yard and chop down GMO contaminated trees. Save GMO-free seed by bagging a flower of a hermaphrodite tree that you have tested and found GMO-free. The seeds of that fruit will be GMO-free trees, but may get GMO air contamination in their fruits. Let your Cooperative Extension office, Master Gardener program, and County and State lawmakers know that you want to garden in a GMO Free Hawai’i.